Preheat the oven on high broil. Season the chicken breasts with salt, black pepper, paprika, and garlic powder and cook all of the way through. 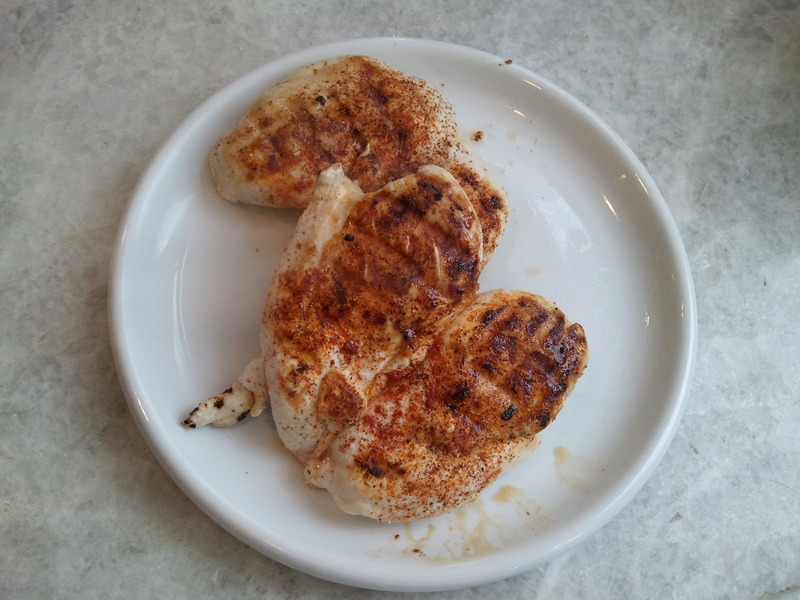 I used the George Foreman to cook them, but you can just as easily grill them outside or sautee them in a saucepan. Once the chicken breasts are cooked, set aside on a plate to cool. 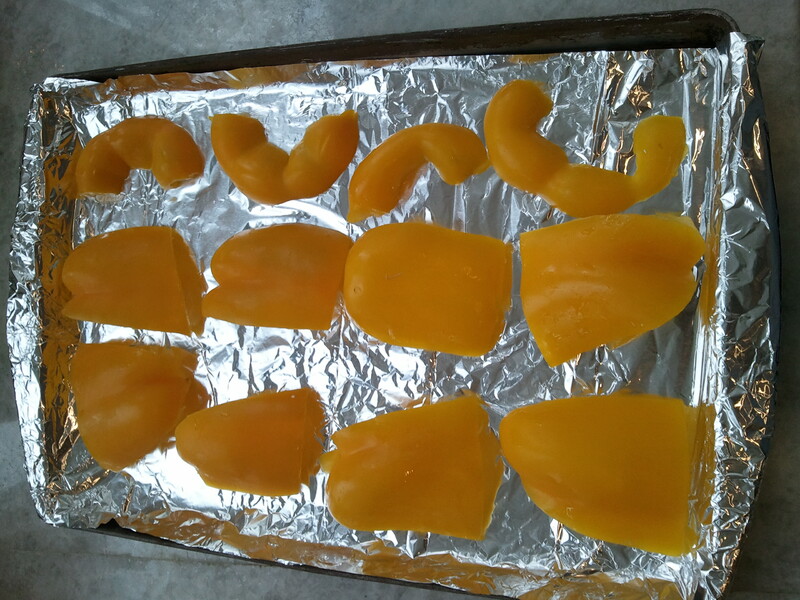 Cut up the bell peppers and place on a foil covered baking sheet to roast and char. Place in the oven for about 10 minutes. Once cooked and charred, remove and set aside for the sauce. Now, cut the chile peppers lengthwise but not all the way through. 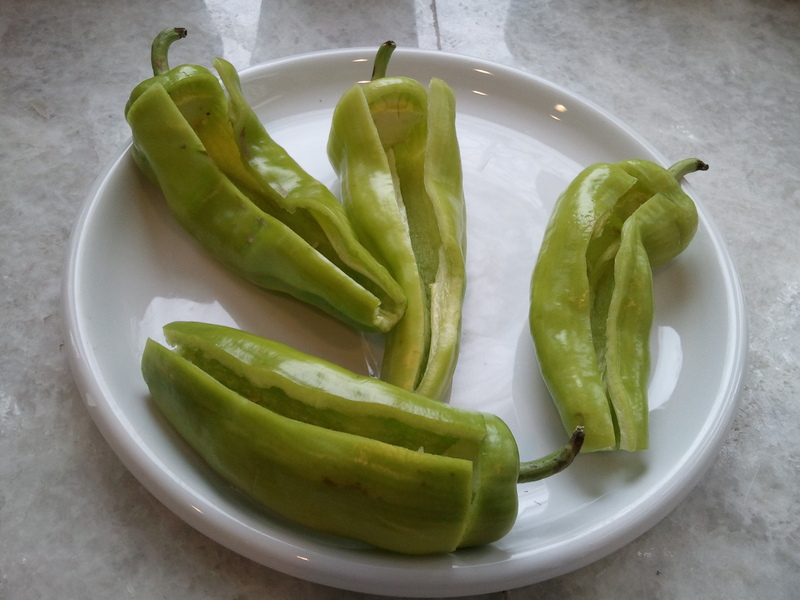 You may need to cut the top as well to allow for the peppers to be opened and stuffed. 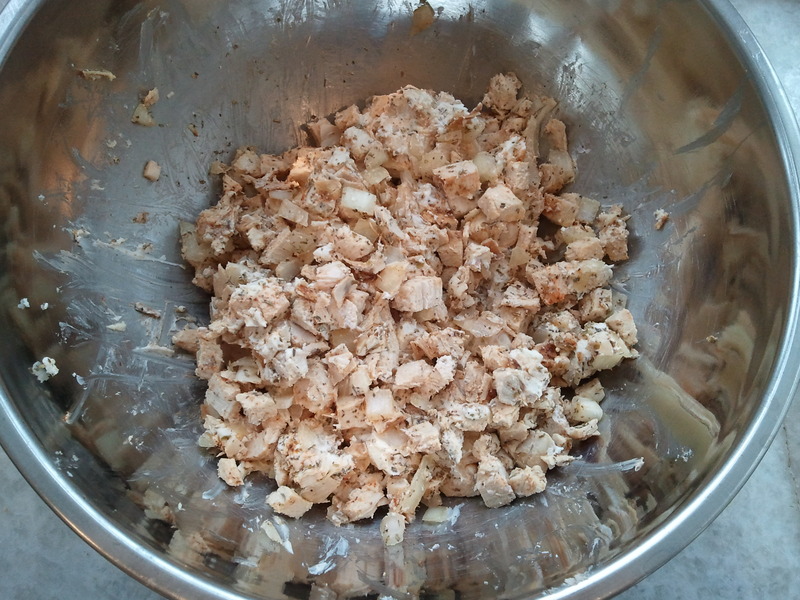 Cube the chicken breasts and place in a large bowl for mixing. Add the chopped onion, goat cheese, oregano and salt to taste. Mix the ingredients for the chicken filling. 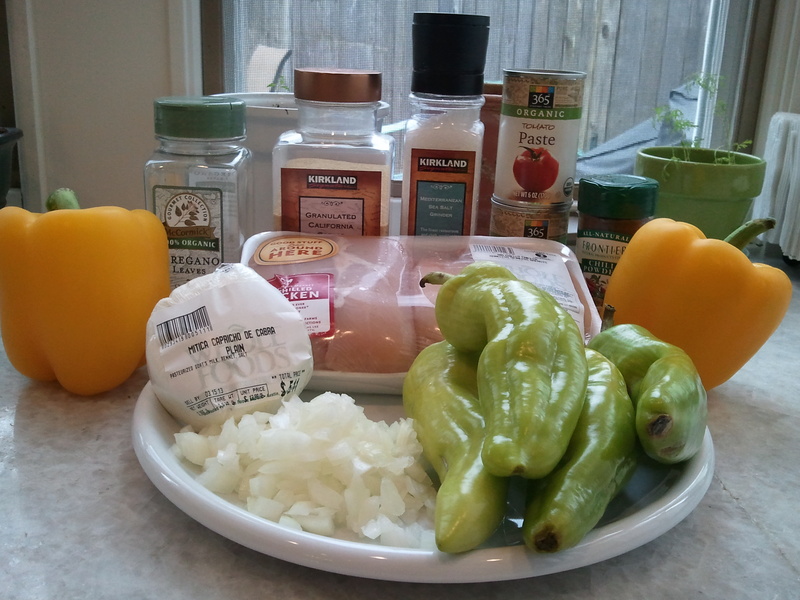 Place the stuffed peppers on a baking sheet that has been lined with foil and greased with coconut oil. Place them in the oven and bake for 20-25 minutes. The chicken is already cooked so you are only actually cooking the pepper. You want the pepper to retain some of its shape so be careful not to overcook. While the peppers are cooking, you can finish up the sauce. 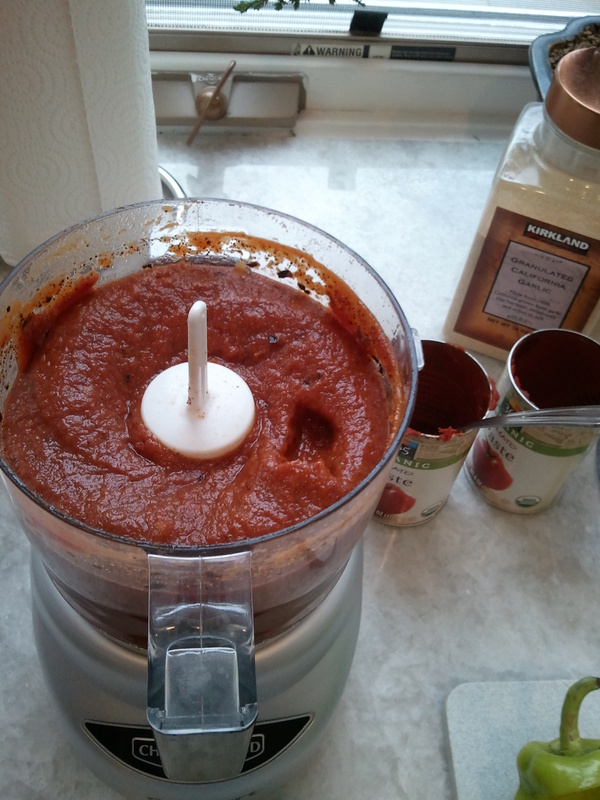 In a medium food processor, puree the charred bell peppers. Add the tomato paste, fresh lime juice and fresh cilantro. Blend thoroughly. Add the rest of the spices to the pepper sauce -(1 T.) garlic powder, sumac, smoked hot paprika, chili powder, and red pepper flakes. Take the stuffed peppers out of the oven and dress with the roasted pepper sauce. I used a sandwich bag and cut off the tip, filled it with the sauce and used the bag like an icing bag (no tip needed). Garnish with some fresh cilantro 🙂 ¡Buen provecho! 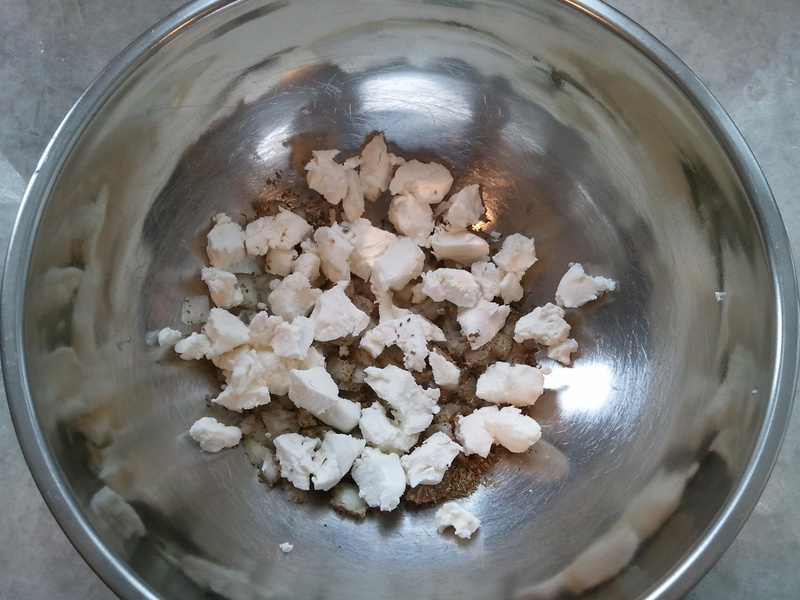 The goat cheese I used was fairly mild; this recipe would actually do very well with a strongly flavored goat cheese. 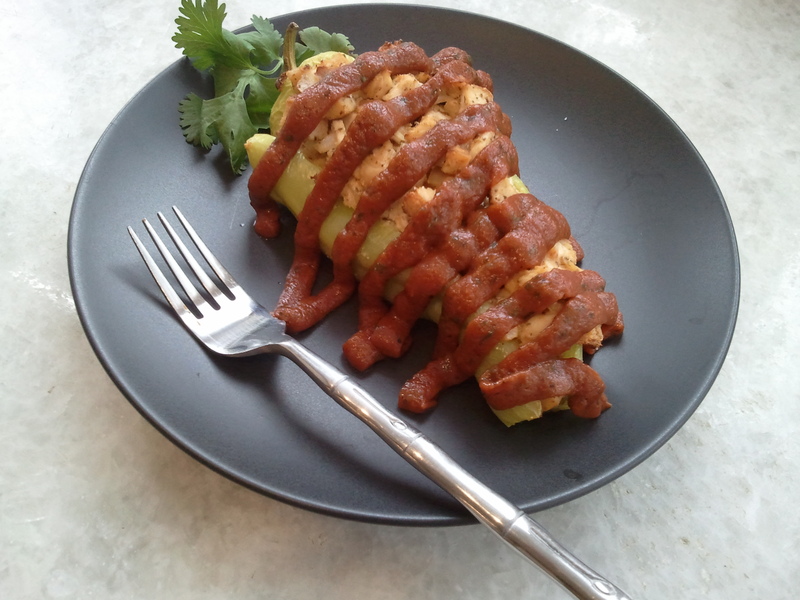 This entry was posted in chicken, has dairy, main dish and tagged bell pepper, chicken, chile pepper, cilantro, goat cheese, lime, tomato paste. Bookmark the permalink.